Mohamed obtained his Bachelor of Science from Alexandria University – Faculty of Commerce. He joined the firm in 2008 and is specialised in trademark registration. 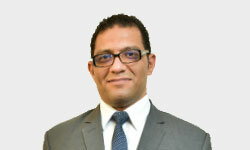 Mohamed is responsible for filing Trademark applications, keeping clients posted with their applications’ updates, clearance searches and conducting appeals, oppositions and counter-statements. Mohamed is a member of the Egyptian Traders Syndicate.